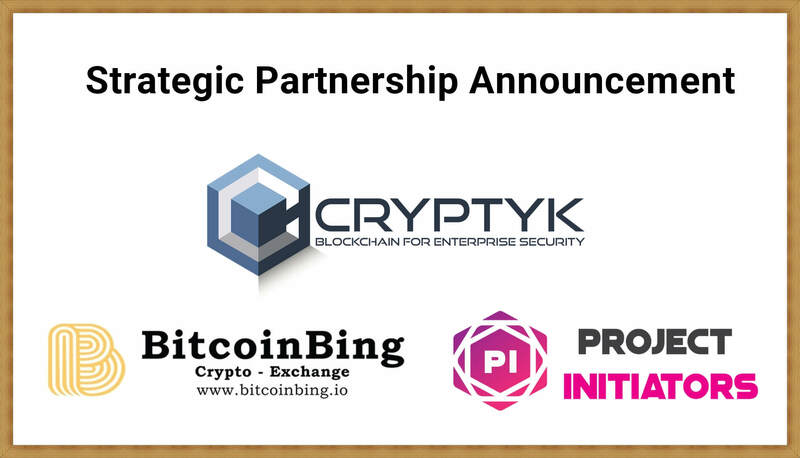 SAN FRANCISCO, Calif., April 14, 2019 -- Cryptyk Inc., a US based developer of enterprise-class cyber-security and cloud storage products, today announced a 3 way partnership with Indian based BitcoinBing Crypto-Exchange and Indian customer partner Project Initiators who are building a decentralized workplace for freelancers and their clients. Cryptyk is developing a unique hybrid blockchain technology that combines encrypted decentralized cloud storage technology with blockchain based security auditing and tracking. The result is a “one-size-fits-all” cloud security and storage solution that is ideal for both large enterprises and their individual customers. The platform replaces 3-4 different cloud security and storage products from existing vendors while vastly improving security and reducing operational costs. Key target markets for Cryptyk technology include banks, financial services, legal services, accounting services, healthcare industries and government organizations. The Cryptyk platform is driven by the CTK Token which provides financial incentives for not only CTK investors and traders, but also third-party app developers and enterprise customers. The company is not only building a security and storage platform but an entirely independent cyber-security economy. As a digital token with practical utility, increased customer adoption of its product platform will place increased demand on the CTK market economy. Consequently, the value of CTK will automatically increase with each new enterprise customer and their individual clients. The 3 way strategic partnership was formalized with a partnership agreement and a token swap with a 6 month vesting period for all 3 tokens. The swap involved $1Million worth of CTK tokens from Cryptyk, $1 Million of BING tokens from BitcoinBing and $2 Million of PI Tokens from Project Initiators. The partnership allows for both Cryptyks token and its product platform to penetrate the Indian market. Project Initiators (PI) are building a decentralized platform to connect and hire freelance workers. As a workplace for freelancers, integration of the Cryptyk security and storage platform into the PI platform will make an ideal file sharing ecosystem for securely delivering work files to clients. The deal also included listing of the CTK token on the BitcoinBing crypto exchange which was just launched this week. Cryptyk CEO Dr. Adam Weigold commented today that “Project Initiators are a natural fit for a new market vertical for Cryptyk, and being Indian based they are at the center of the global freelancing industry. Moreover, listing on the BitcoinBing exchange will help increase CTK volume in a new geographic market for us and we strongly believe in the integrity of this crypto-currency exchange. It is a Win-Win-Win deal for all 3 companies. It is important to note that our $1 Million contribution to the token swap was valued at a price of 8 cents which is ten times higher than the current CTK price around 0.8 cents This not only validates the true value of the CTK token but also implies that CTK is extremely undervalued at the moment. Customers are often a much better judge of real market value than investor sentiment. This partnership gives us penetration of both our product platform and CTK token into the massive Indian marketplace. We look forward to working closely with both Project Initiators and BitcoinBing for our mutual advantage. "